Acyclovir, also known by the brand name Zovirax, is a generic prescription antiviral medication for the treatment of certain infections. It is primarily used to treat infections associated with the herpes virus. Acyclovir (Zovirax) is effective for treating individual infections, but is not a cure for the underlying virus. It will reduce the length and severity of the infection and may prevent it from spreading. Acyclovir medications accomplish this by attacking the infection that has occurred and preventing it from continuing to grow. 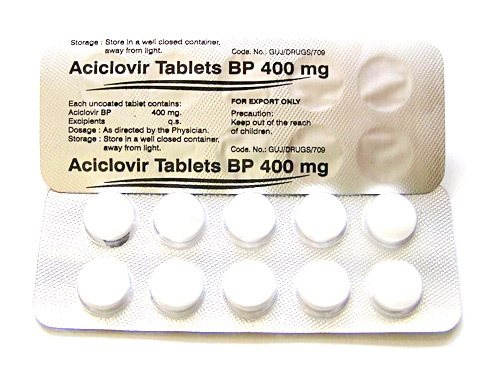 Acyclovir is available in 800 mg and 400 mg tablets. In capsule form, Zovirax can be obtained at a dose of 200 mg. This medication is also offered in a 200 mg suspension and may be obtained in ointment and injection form as well. Acyclovir is used to treat infections associated with the herpes virus including cold sores from herpes simplex, chickenpox and shingles from herpes zoster. Acyclovir will help to heal the initial rash and discomfort but does not eradicate the underlying virus. Acyclovir (Zovirax) may be used in children over the age of 2. This medication is occasionally used off-label to prevent chickenpox in those exposed to the virus and for the treatment of other viral infections.